Virtual Reality has boomed in quite a small time in front of our eyes, but to actually experience it in an immersive way is still a jaw-dropping experience. The VR headsets are a unique invention that let us participate and live in the moment via technology. At first, this seemed like the next big thing in the market but gradually people started to feel the nuisance that the wires attached to it and its overall design can cause hindrance in movements and the whole experience. 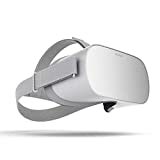 Oculus came with a solution to this problem with the Oculus Go, a wireless headset that gives total freedom to the user and makes the experience of virtual reality more lucid. It sports smooth and adjustable Velcro straps and a matte finish plastic case. There is some foam used for air passage and comfort. The plastic body although being light in weight does not give a cheap feel to the body. It has volume rockers, a micro USB jack and a power button on its side, there is also a built-in microphone present at the bottom. The box contents include a single wireless controller, a glass spacer which is very convenient for people who use glasses. Other contents are a double A battery for the controller, a lanyard wrist strap, a lens cleaning cloth and a micro USB cable. Coming to its specifications, it checks all the boxes here. It comes with a Snapdragon 821 processor and 32 gigabytes of storage. It has a screen resolution of 2560 x 1440 with an LCD screen. This resolution is better in comparison to most of the PC VR headsets. The refresh rates here are 72Hz. It is not likely to perform well with PC games but will handle the top end mobile SoCs including Qualcomm Snapdragon 800 series and Mediatek chipsets. Coming to the audio, this one includes a dual speaker that produce decent sound quality and produce a surround sound effect. The battery can last for around 2 or more hours while playing games or watching videos which are enough at this price range. With over 1000 VR experiences available, it is more likely to be used for entertainment purpose rather than being used for a full gaming experience. The biggest reason to buy this is its price. Available for only $199 at Amazon, it is a steal. 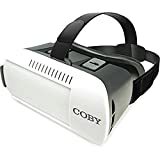 For anyone who is just stepping in the VR world, this one is highly recommended to start the journey with.